Every day at 9am and 1pm, a small group of people who wait in line get to pay 100 Egyptian pounds ($18) to climb into the Great Pyramid of Khufu and all the way up to the burial chamber. Cameras are confiscated at the entrance, because otherwise who will buy the postcards? Luckily my Nokia N95 was let through as it was deemed just a phone. Standing in the middle of the most impressive architectural feat ever (in my opinion) is a humbling moment. It’s very warm in there, and there is a very deep and pervasive rumble, which we eventually sourced to the ancient ventilation shafts, through which the air was rushing. I took out my camera phone — not surprisingly, there is no reception inside a 7 million tonne stone monument. A visiting friend happened to be walking up the steps of the Great Gallery so I took a picture. Where exactly were we? 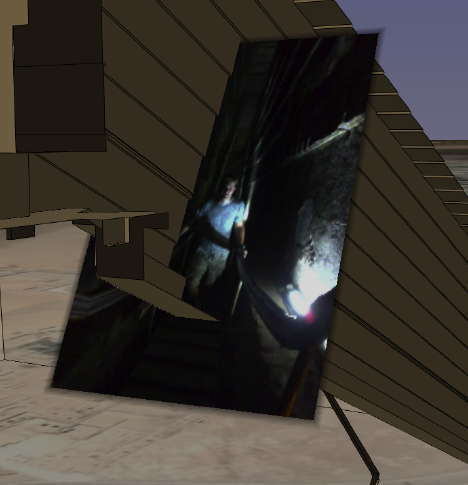 ATF’s accurate 3D model of the pyramid provides the best possible contextual information, and since you can now accurately position photos on Google Earth, why not combine the two? 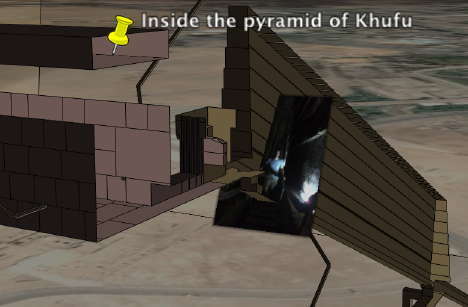 Download ATF’s model of the Great Pyramid, then download this photo, added using version 4.2’s <PhotoOverlay> tag, to see where inside the pyramid it was taken. Note: you need to turn off the terrain layer in order to see the 3D model of the pyramid and Stefan’s photo overlay properly.